What many people call “productivity” often amounts to little more than selective procrastination—deciding, often at 4:30 in the afternoon, what tasks we simply cannot accomplish before our deadlines. While there are dozens of to-do apps and productivity systems available in the App Store, Put Things Off appeals to the slackers, the overloaded, the remaining few who do not worship at the altar of David Allen. Here’s to the crazy ones. Today’s The Thing: While it would seem to foster procrastination, Put Things Off can be an effective to-do list manager, thanks to its simplified system of classifying tasks. Pocket Jam’s $3 Put Things Off is actually based on a simplified GTD-style system. Tasks reside in one of four “bins” depending on their status. However, this approach lacks contexts, tagging, priorities, and many of the other trappings of regular task management applications. True to its name, Put Things Off makes it remarkably easy to put things off for a fixed amount of time, which can be set for 1 to 31 days in the app’s built-in preferences. Of course, it’s also easy to move a task to the “Today” bin, or manually change the due date. 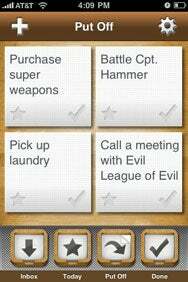 The app has some visual flair and sound effects which make using Put Things Off more fun than what you’d experience with the typical to-do list manager. By omitting status notices and overbearing reminders, Put Things Off remains guilt-free. If you value more powerful task management features, then Put Things Off will offer you very little beyond novelty sound effects. However, if the complexity of many current task managers leaves you feeling overwhelmed, Put Things Off is an enjoyably scaled-down option. Put Things Off is compatible with any iPhone or iPod touch running the iPhone 2.2 software update.